We have been doing a few posts on wordless picture books in our quest to find the best books for boys. Each wordless picture book here was chosen specifically with boys in mind. There are so many reasons to read wordless picture books. We love them for their beautiful illustrations, how each person can create their own stories from them and for their imagination and creativity. If you have not yet discovered wordless picture books I encourage you to give them a try. You can find links to two additional articles on wordless picture books, including our article on The Benefits of Wordless Picture Books, at the bottom of this post. This selection of wordless picture books includes those that are a bit off the beaten path, a little less know, but of high quality and dare I use the word delightful? Yup! Hank Finds an Egg by Rebecca Dudley. Oh my, I think I love Hank 🙂 Hank is a little bear who finds an egg. He tries to put the egg back where it belongs but runs into a bit of trouble doing so. Rebecca illustrated the book with her own creations. I really like her style. Hank Finds an Egg is her debut book and I personally am hoping for many more. This is a sweet and wonderful book. Inside Outside by Lizi Boyd. There is a lot going on in this book. Boys can keep an eye on the little mouse and the turtle. There are die-cuts in the book showing the outside while the boy is inside and vice virsa. This is a really neat little book that has a ton of tiny details to keep a younger boy’s interest. In one word: Charming. Rainstorm by Barbara Lehman. We are fans of Barbara Lehman books. Her storytelling style really appeals to us. In Rainstorm a young boy is alone and a bit bored in a big house . . . until he finds a key. Fun and imaginative. The Umbrella by Ingid & Dieter Schubert. A small dog, an umbrella, and some wind equals an exciting adventure. Great animal illustrations! Really enjoyable. Journey by Aaron Becker. This book has a girl in it. (LOL) As the main character no less! Yet, it is a great book for boys. It is magical, delightful, and imaginative. The illustrations are stunning and there is adventure and even a rescue involved. Some of the pictures of the airships are very steampunk inspired. A very cool book and I am certain boys will like the ending. Wonder Bear by Tao Nyeu. Unusual and unique, Wonder Bear is a fun book to read. The illustrations are very stylized and we enjoyed them. Two children, a boy and a girl, plant seeds. What they get will surprise and delight. Bubble lions, silly monkeys and ocean animals coming from leaves. Plus Wonder Bear, oh yes, don’t forget Wonder Bear. Chalk by Bill Thomson. T-rex at the playground holding a gift bag with chalk in it. As you can imagine, this is no ordinary chalk. Very young or sensitive boys may find it too intense. Other boys will eat it up. Rain by Peter Spier. We love it. We have read this book so many times I am surprise it is not falling apart. A brother and sister experience a rainstorm, not by staying in but by going out and exploring. Very well done. The illustrations have a lot of small details that are fun to look at. The Tree House by Marije Tolman and Ronald Tolman. If you have a boy who likes treehouses and animals then this is a book you need to put on your reading list. I will tell you that the book is unusual. The illustrations are fabulous and colorful. It starts with a treehouse and one bear, then two bears and two books and then . . . Can’t spoil it for you. It ends rather suddenly but we just went back and read it again! 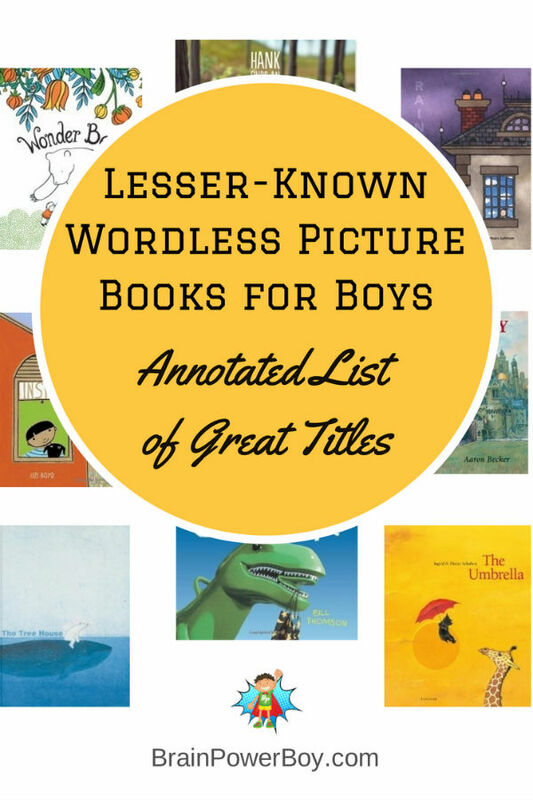 I hope you enjoy this best books for boys lesser-known wordless picture books list. We enjoyed putting it together for you. In case you are wondering why I didn’t show you a picture of my favorite book on the list (Hank Finds and Egg) it simply refused to show up as anything other than a tiny box. Amazon issue 🙂 You can click through here to see it if you like. See our list of Classic Wordless Picture Books to get more ideas for wonderful books and find out about The Benefits of Wordless Picture Books as well. Awesome suggestions as usual Sheila! I’m pinning this one and then saving it to my Evernote for when my kiddos are a little older. Thanks Clare. I certainly appreciate the pin! Thanks for sharing this great list. We really enjoy picture books. This is such a great list. We love many of the books on it. One of our new favorites is a wordless picture book calle Flashlight by Lizi Boyd also author of Inside/Outside. It’s really fantastic. Thanks for the nice comment on the list. I will certainly be looking for Flashlight to check it out as I really liked Inside/Outside. Journey has a second book which DOES have a boy in it called Quest. It is just as good as the first one! I have always made sure my son had plenty of wordless books around. Now he is in 5th grade and absolutely loves to read. I highly recommend the Polo books. Before After is another good one too And of course we love Flotsam. Hi Barbara, Thank you for taking the time to comment. We appreciate it! I agree with your selections and am so happy your son loves to read. Before/After is on our list for the next wordless post and I will have to revisit Polo – I kind of forgot about them. Thanks for the suggestion Kali!